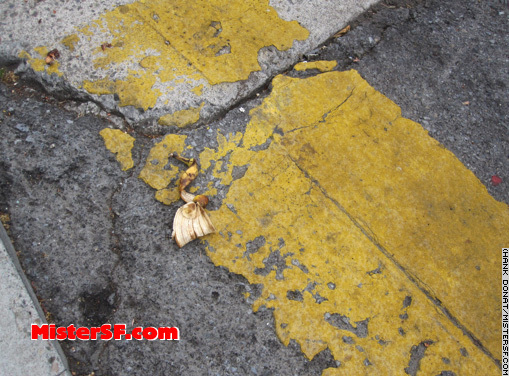 Nearing City Hall for the possible return of gay marriages yesterday, I spotted this banana peel in the crosswalk near the northeast corner of Gough Street at Turk. It has to be an omen, I thought. Maybe Lucy is watching over us, or maybe it means something not so good, or maybe nothing at all. No, it’s only the wedding day superstitions of a witness. 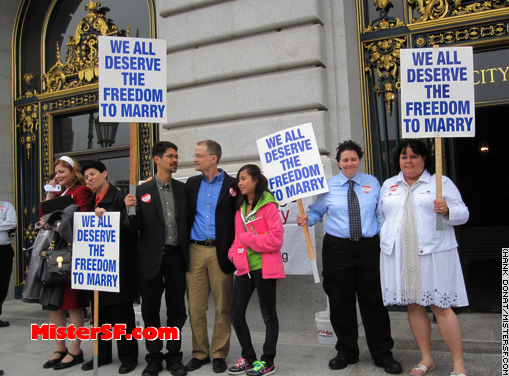 I wondered how the possible brides and grooms must feel, waiting for Judge Vaughn Walker’s decision on whether to lift a temporary stay of his ruling that overturned Proposition 8 last week. 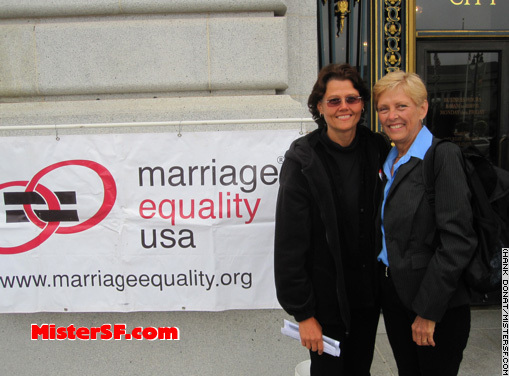 Nervous and excited, Midge Detro and Sandy Simmons were among the twenty or thirty gay couples who planned to get married at SF City Hall Thursday following the anticipated lifting of the stay. Before 9 a.m., Rod Wood and Roger Hunt are first in line at the Clerk’s Office and already giving their first interviews. 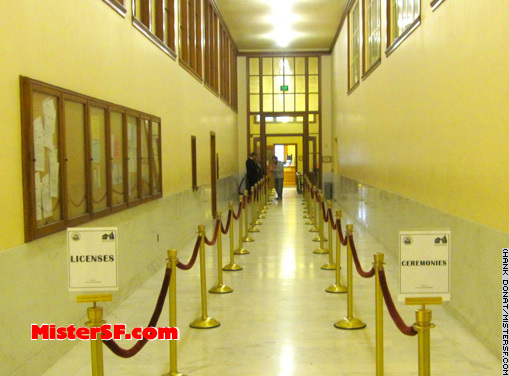 They and others would wait more than three agonizing hours for the judge’s decision on the stay. 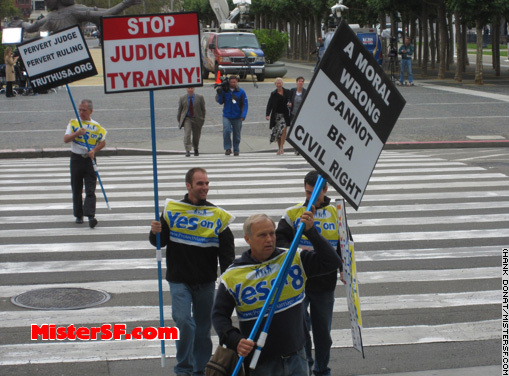 Fighting for your right to take mine away, these men refused to let good taste prevail upon the morning. But, they did show up ready for ribs and lobster in their Yes on 8 bibs. 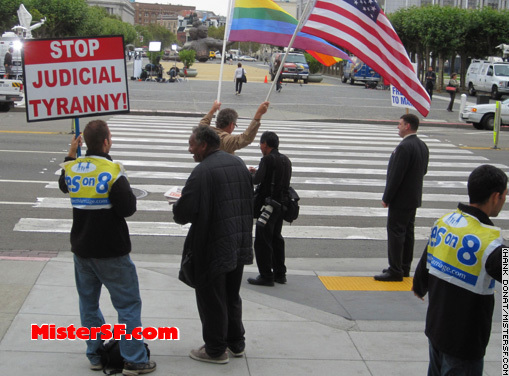 The Marriage Equality USA activists steadfastly put forward their familiar image, without engaging the haters. 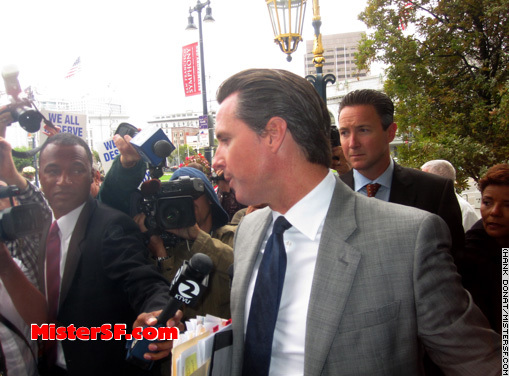 Gavin Newsom arrives for work, praises Judge Walker’s decision to overturn Proposition 8. 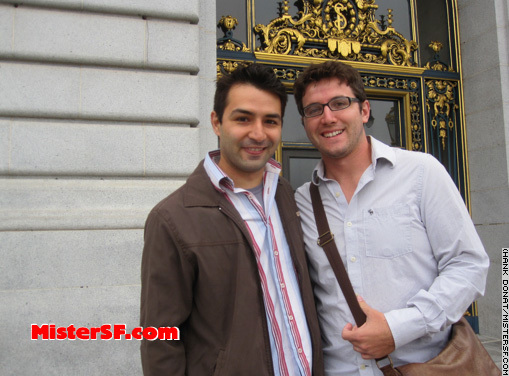 A staffer later tells me that the mayor will not be performing any gay weddings that might take place this day, as his doing so would likely distract from the couples. The mayor tends to “become the story.” A while later the staffer changes this to a “maybe.” Apparently Newsom is darned if he does and darned if he doesn’t.